Normie Buehring has plans for the 2018 trial crops at the Northeast Mississippi Branch Experiment Station, and he's not even going to be there to see their harvest later this year. 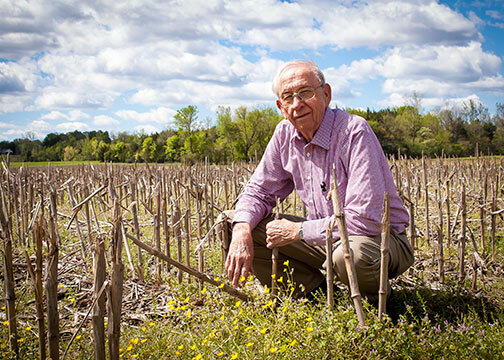 The research professor with the Mississippi Agricultural and Forestry Experiment Station is retiring in April after 45 years of service to Mississippi State University and the state's grain crop producers. Buehring was honored during the annual North Mississippi Producer Advisory Council meeting Feb. 15 at the MSU Agri-Center in Verona. The meeting provided producers in 22 of the state's northern counties an opportunity to meet with MAFES researchers and MSU Extension Service specialists and provide input for future research and programming. Buehring procured nearly $9.5 million in grant funding, published more than 400 publications and earned numerous research honors during his tenure. "Normie is a man growers appreciate and respect," said Reuben Moore, interim associate vice president of the MSU Division of Agriculture, Forestry and Veterinary Medicine. "They came to his field days because they wanted to communicate with him and they wanted to learn something." The annual PAC meetings were also one of the main outlets through which producers had access to Buehring's wealth of knowledge, said Jane Parish, head of the North Mississippi Research and Extension Center. "For this part of the state, Dr. Buehring has been the go-to contact for row-crop research and advice," Parish said. "He's done countless field days and producer presentations, and he would take what producers were telling him at these meetings each year and work that into his short- and long-range research planning so he could answer their questions. He is leaving a huge legacy here." Buehring said he was thankful for the opportunity to work at MSU. "This is the place where I was supposed to be," he told approximately 250 north Mississippi producers at the meeting. "I cherish having gotten to work with all the growers and researchers across the state I've known over the years. It has been a blessing to be here." The meeting concluded with reports from producers on research and educational programming needs.